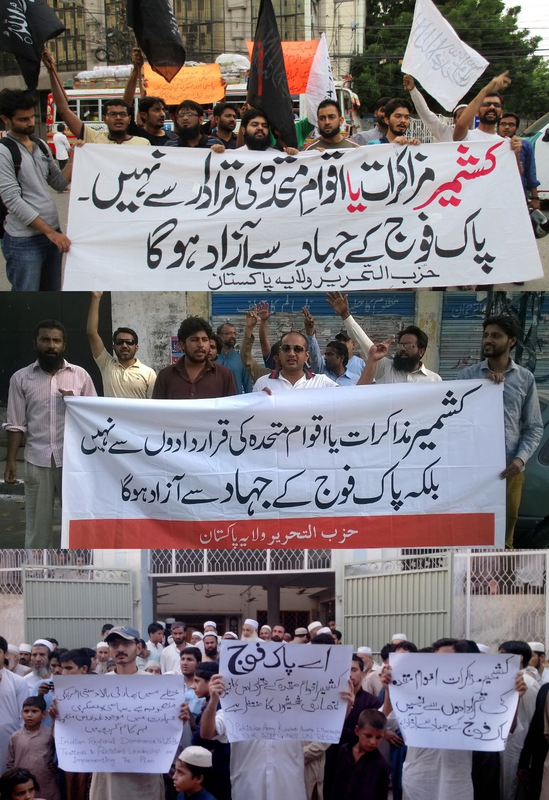 Hizb ut-Tahrir Wilayah of Pakistan held demonstrations across Pakistan to convey a message for Defence Day regarding the liberation of Kashmir. Participants held banners and placards declaring, “Kashmir will be Liberated through Jihad by the Pakistan Army, Not By Dialogue Nor UN Resolutions” and “Criminal Silence Over Indian Aggression Is Treachery Against Pakistan, Muslims and Islam”. Since the independence of Pakistan, traitors in the political and military leadership have been playing with the emotions of the Muslims of Kashmir and Pakistan, repeatedly pinning their hopes on the resolutions of the United Nations. The Muslims of Kashmir and Pakistan have come to the conclusion that Kashmir and Indian aggression issue can never be solved by the United Nations resolutions, nor through the mediation of the “international community.” The United Nations and the “international community.” led by America can never be friends of Muslims because they are open enemies of Islam, Rasool Allah (saaw) and the Muslims. The so-called international institutions are in fact tools of colonialist powers and they use them to secure their interests in the international arena, even if this leads to the killing of hundreds of thousands of people, or usurping of the rights of other nations. The message of the Defence Day of Pakistan is that the issue of Kashmir and Indian aggression can be addressed comprehensively, if the Pakistan Army and the Muslims place their trust in Allah (swt) and respond in a manner which India understands, as they did fifty years back, in 1965, when they heroically struck their enemy with all their might, even though the Muslims were heavily outnumbered. Hizb ut-Tahrir makes it clear to Pakistan's armed forces and the Ummah that the real power of Muslims lies in their Deen (Islam), and whenever Muslims have made their Deen as a source of power, Allah swt granted magnificent victories, despite the greater numbers of their enemies. Therefore, it is the responsibility of the sincere officers in the Pakistan Army, who have pledged to defend their Deen and land, to uproot the traitors within the political and military leadership that are burdens on the neck of the Ummah and establish the Khilafah in Pakistan, by providing Nussrah to Hizb ut-Tahrir. Only then will we have a state based on Allah’s Deen. Only then will our armed forces mobilize in Jihad for the liberation of Kashmir, ending Indian aggression, with the help of Allah (swt). And beyond His help, no other help matters. "کشمیر پاک فوج کے جہاد سے آزاد ہوگا"
"اگر اللہ تمہاری مدد کرے تو تم پر کوئی غالب نہیں آسکتا اور اگر وہ تمہیں چھوڑ دے تو اس کے بعد کون ہے جو تمہاری مدد کرے؟ ایمان والوں کو اللہ تعالیٰ ہی پر بھروسہ رکھنا چاہیے"